As the name suggests, these games focus on Fraction, Decimal and Percentage concepts. Perfect for Students in Year 6 and 7 these three games link the idea of finding a 'fraction of' a number, 'percentage of a number' and multiplying by a whole number by a decimal. Initially students use an MAB flat of grid paper to support them calculating with fractions decimal and percentages. After plying each game the links between fractions decimal and percentages can be highlighted. All games come packed in an attractive box with enough pieces for 4-6 players. 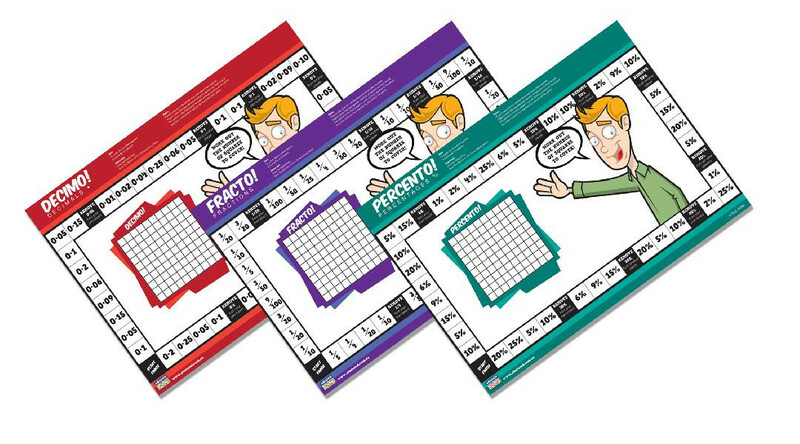 The board is made of sturdy card and comprehensive teacher notes are provided so that teachers can help children gain the most from playing the game.